We’re back with part 3 of Overheard in Product—a series where we round up all of the tantalizing conversations from product folks that you may have missed on the web last week. This week, we talk about low morale among engineers, the alignment journey, the tradeoff between time and quality, B2B product analytics, and a friendship that changed the course of Google's history. First up: Ryan Singer, Head of Product Strategy at Basecamp, discusses what’s going on with engineers’ morales and how to fix it. 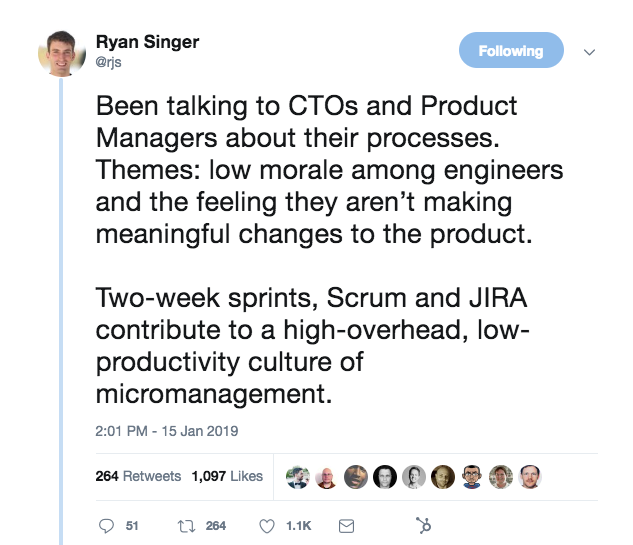 There’s a lot of discussion in the thread about the causes of micromanagement, the length of sprint cycles, and where deployment cycles can—and should—fit in those cycles. A meaty read for folks in similar situations. It’s Tuesday, do you know where your alignments are? 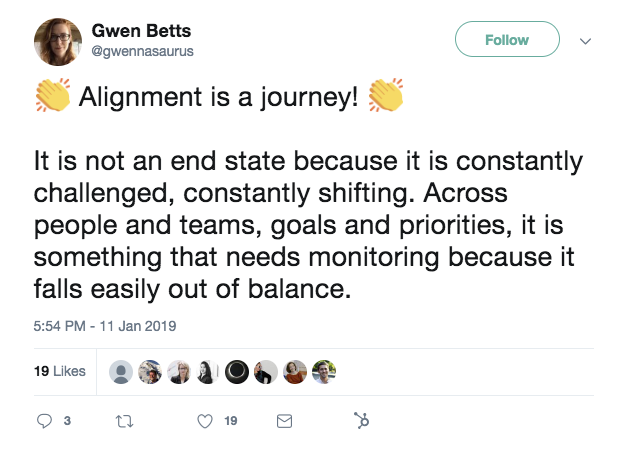 Next up: Gwen Betts, Director of Product Experience and Delivery at Rapid7, reminded us that there’s no end to working toward alignment. We couldn’t agree more. Constant communication is key to alignment. After all, repetition doesn’t ruin the prayer! May the force...beam you up? 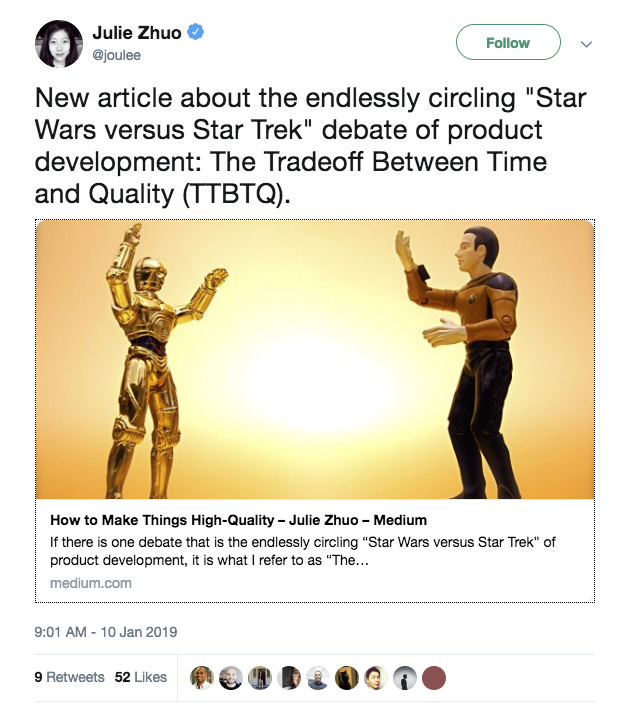 Julie Zhou, Product Design VP at Facebook, wrote a fantastic Medium article about the endless debate between polishing and shipping. The Sunk Cost fallacy is alive and well, folks! But Julie ends with 6 tactics to ship high-quality work exceptionally well. See for yourself. 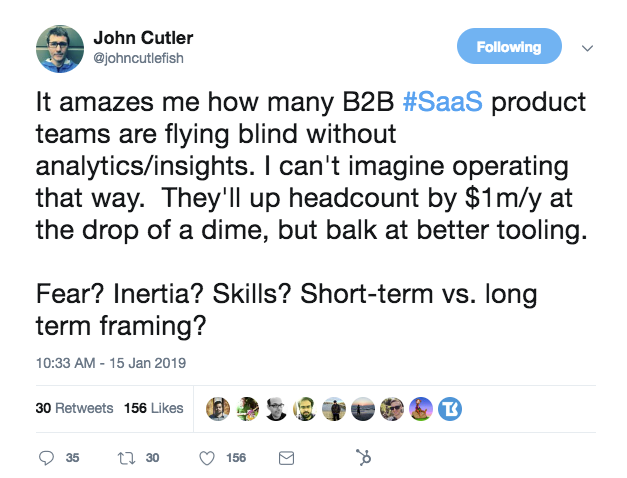 John Cutler, Product Evangelist at Amplitude, has a great (growing) thread about analytics and B2B product teams—or rather, the lack thereof. Folks offered up their own theories—inexperience, inability to make a decision, fear, even hubris. But no one seemed to deny that it’s a real problem. 🎩 Hat tip to our very own product designer—Emily Carlin—for this week’s bonus round. Psst—If you want to expand on these product topics or others by writing for our blog—get in touch. We’d love to chat!